Tamil superstar Ilayathalapathy Vijay’s much-awaited film, Mersal, is nearing its completion. 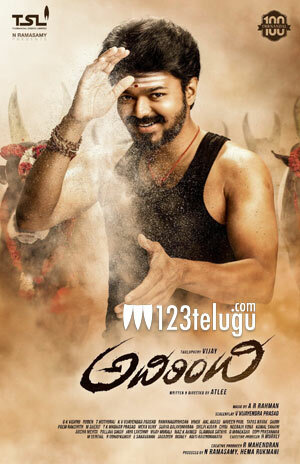 The film’s Telugu version is titled Adirindhi. As per the latest updates from the Tamil media circles, Mersal’s producers at Sri Thenandal Films are planning a grand release in the twin Telugu states. Already, Sardaar Gabbar Singh’s producer Sharrath Marar is onboard Adirindhi as its presenter. The latest update is that the film’s Tamil and Telugu versions will have a simultaneous release during Diwali. With no major films announced so far for Diwali, it’s advantage Adirindhi as of now. The producers are stepping up the hype around the Telugu version with full page ads. Atlee is directing Adirindhi that also stars Kajal Aggarwal, Nithya Menon and Samantha. AR Rahman is scoring the soundtrack for this prestigious movie.